Yes, ’tis the season. It used to come right after Thanksgiving, as in the Friday after, but now XMas Retail–totally different than Christmas (a post for maybe Mitch Teemley to muse upon?) is upon us. And with it comes all the holiday hoopla: decorations, music, food, commercials, events, and specials. Mike Allegra and I are taking on Christmas specials based on children’s books in this month’s issue of Debatables. Last month we discussed which children’s lit character deserves to be a Macy’s Day Parade balloon. Mike won that round. See all the glorious discussion and scrabbling here. If you are not familiar with Debatables–Welcome! Each month, Mike Allegra and I take on debating mostly meritable topics concerning children’s literature. We each state our initial argument in about 250 words and then add on a 150ish counter argument. You then, dear readers, vote accordingly and add in commentary. Mike and I look forward to the votes, and truly relish your comments. Mike says the score is now 3-2. I lead. This could be an important session. I am offering the perennial classic: Rudolph the Rednosed Reindeer, based on the song, which is based on the Montgomery Ward coloring book. You probably didn’t know that, did you? 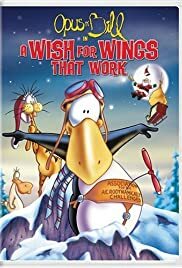 Mike, that gregarious children’s author who is rocking the publishing world with ninja cows and princes of regard, is suggesting a relative newcomer to the seasonal menu: A Wish for Wings That Work based on the title by adult/children’s writer Berkeley Breathed, known for his Bloom County comics. Few creatures, (even in Christmas specials) match the inimitable, innocent, guileless sweetness of Opus the Penguin. His personality stands in stark contrast to his id-inclined Bloom County comic strip cohorts. This big-shnozzled little fella always puts others’ needs before his own. So it seems only fair that as Christmas approaches Opus should take a little time to consider his own wants. And Opus wants to fly. He needs to fly. A Wish for Wings That Work was published after Berkeley Breathed suddenly (and heartbreakingly) discontinued the Bloom County comic strip. It’s arrival was like a breath of fresh air. Opus was back! And he was in a wonderful story, pursuing a passionate goal—a goal he achieves just by being his old penguin-y self. The cartoon (presented here in full) remains true to the book while expanding upon it, drawing in old favorite Bill the Cat as well as introducing new characters from Breathed’s then-recently christened Sunday-only strip, Outland. It’s a cartoon that works on just about every level, even if you aren’t familiar with Bloom County (but especially if you are). Much like Bloom County, the special mixes the sweet and the salty, kid humor with adult humor. And it rewards people who pay attention; some of the best jokes linger unobtrusively in the background. How about the Abominable Snow Monster? From a kid’s coloring book to a traditional song to a classic cartoon—Rudolph the Rednosed Reindeer is the one special that is so special it’s the special of all specials. All the others are simply paying tribute to an original. It’s been part of tradition since 1964, and keeps on ticking despite current fine-tooth scrutiny for issues. Rudolph and his friends provide a generational bonding, and the bonus is everyone can sing along. As a child, I watched Rudolph every year and enjoyed it. As an adult, however, the Rudolph story bothers me. Poor Rudolph is cruelly shunned by his peers—and is only accepted back into the fray once his glowing nose proves useful. That’s a Christmas story that could’ve been written by Ayn Rand. Rudolph overcomes adversity with the bonus of acceptance, providing a story arc of beginning, middle, and a rousing resolution. Opus? He is harshly teased by some really odd ducks, who eventually come around to helping him out with his flight fantasy. Yet, there is no real resolution. The last we see of Opus he’s enjoying mock-flying. How long is that going to last? And Bill—Mike, did you forget how cruelly Opus treated the cat he rescued? He never even apologized for his scathing remarks. Rudolph is upbeat while Bloom County is quirky. Rudolph or Opus? Which special is special to you? Cast your vote, and add your comments. Thanks for stopping by and watch out for fruitcake. That’s one tradition we could do without. I adore Opus, but it’s got to be Rudolph. I mean, we’re talking CHRISTMAS here and that’s Rudolph. Plus, Burl Ives. I may have missed the fine print, but are we voting on which story is the most special Christmas one? Absolutely! Cast your vote. Not sure why everyis so shy to do so this round. Busy with Christmas? I’m four days behind on my Reader’s Feed. I understand the reader support for Rudolph, but, Cricket, you’re inadvertently sabotaging my argument! Not properly downloading the Opus special on YouTube (which I’m sure few of your readers have ever seen) and distracting us with weird font sizes? Proper presentation of the arguments can mean a lot. Get with the program, you! And remember the last Debatables at your place? Text running off the page… how can I compete when my arguments are so cruelly tampered with? Quit your Grinching. Gnomes are fiddling with my fonts. Good in edit and then kablooey when posting. Readers will figure out clicking on the hot links. We have brilliant readers who will be dazzled by content and sound reason. Go chillax with some egg nog until then. Egg nog? Ew. Cocoa all the way. Pingback: Debatables: The Better Christmas Special – Hey, Look! A Writer Fellow! Rudolph. Hands down. That abomibiblely dude scared the BEJEEBIES outta me! Who is that other one? Never heard of it….is it a Christmas special on TV? Is it on after Rudolph but before Frosty? Huh? Go to my blog, silly! The special is right there for your viewing pleasure! “YouTube has not configured their sight correctly for your viewing” I’ll have to check it at home. Just vote for Rudolph and not worry about tracking down videos that are not cooperating. So that’s a yes for Rudolph? Or a reaction to Mike’s video choice? Oh most assuredly a vote for Rudolph is a Vote for AMERICA!!! Now, Cricket. Is that the Christmas spirit? No wonder you like the Rudolph cartoon. You can identify with the bullying instincts of Dancer, Prancer, and Vixen. You’re attacking Rudolph and call me a bully?!? I would never attack Rudolph! He is a good little reindeer. I am attacking his close-minded peers. And Rudolph is all the better for his ability to get them to realize the error of their ways. Thanks for that point which helps my argument. You are a pal. The close-minded often discourage others from seeing both sides of an issue. Ya know, like an Opus Christmas Special. Now, I know Boo rather well as a bloggy pal. She will probably stick with Rudolph after seeing the Opus special. But to discourage her from seeing it, Cricket? For shame! This is why our poor nation is so divided. We refuse to consider the often valid views of others! Oh, I had hoped so very much that the spirit of Christmas would’ve thawed your competitive streak. But it was all for naught! Who discouraged her? What?!? I even directed her to the link on my site. Got some serious maligning if intent going on here, sir. It’s on my blog too, along with a Rudolph clip. Just ignore Mike’s misguided pleas. Reindeer not penguins—you are on it, Boo. Reindeer ARE Christmas. Penguins are…..funny. Opus. Rudolph bothers me more and more every year. He gets bullied until they realize they can exploit him. Admittedly the Island of Misfit Toys is the American ecclesiology, but still. Opus. Hmm, his willingness to help doesn’t quite fit the exploitation idea. And the creme la creme is that the nerds save the day! So I will let you ponder and think about that vote. We often willingly take part in our own exploitation if we think that’s the best we’re going to get. I was bullied for years in elementary school. Bullying is relatable for me as well. Lots of tiny jokes through school. I see Rudolph as making the best of his situation and choosing not to be bitter about his previous treatment. It’s a great message to kids—fly above those who treat you unkindly. Sounds like someone is ready to move from the nice to the naughty list. Wait—is that the sound of coal dropping into a stocking? I’d say calling Santa an opportunist is not a smart move. The Santa in Rudolph is a real turd. Maybe it was because he was hangry? But Santa is AWFUL in the Rudolph cartoon! He perpetuates the cycle of shaming. The real Santa would never do such a thing. The real Santa should sue for libel. I have never been a fan of Rudolph — guess I was older when it was televised. But I am not familiar with A Wish For Wings That Work. Enjoyed the video Mike had on his site. It is cute and I like Opus. It is more appealing to me than Rudolph. But neither wow me. So a marginal vote for Opus. Do you have a favorite adaptation, Patricia? I have to say I was unconditionally behind Rudolph. It has a lot of sentimental value and brings back fond memories. It is tradition to watch it. However, I had never seen nor heard of Opus and company. Thanks to Mike providing the link I spent a half hour with them and fell in love with Opus and his misfit cat. It really is wonderful and magical. The magic isn’t the kind that is hard to believe. It’s the kind that make neighbours help each other to fulfill their dreams. I like that kind of magic. Surprisingly, I am with Mike on this one. Michelle agrees with me! Michelle finally agrees with me! Never even knew the Opus one existed! So that’s a vote for Rudolph because going with the familiar and traditional feels right. Right? Ok.. I know I am late to the game and I also know the winner has been declared so I made an effort NOT to read the other comments but I wanted to get in my 2 cents as it were. I was not familiar with the Opus story so I watched it to give it a fair chance. Sorry Mike.. but I am with Cricket on this one for several reasons but here are Two. 1. I did not like the way Opus treated his friend the cat (and never apologized for) especially since it was his tater tot brained cat that gave the geese/ducks (not sure what they were) the idea to take him flying and gave him his Christmas wish. 2. Rudolph is getting major bad press these days and that is all complete &^%$#@ because while it is about bullying, it is ALSO about how Rudolph ultimately won over the hearts of the other reindeer and saved the day. It also TAUGHT that bullying is wrong. So Rudolph is and always will be one of the absolute best Christmas stories of all time!